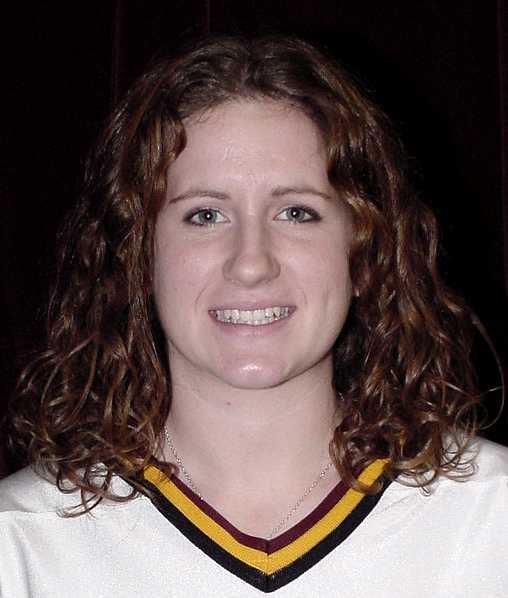 4/09 Cobber Women's Hockey Schedule for 2003-04 Now Online. 2/28 Cobbers Score Late Goal, But Still Eliminated by Gustavus. Concordia was unable to climb all the way back from two-goal deficit late in the third period and lost in the semifinals of the MIAC playoffs 3-2 to Gustavus. Trailing 3-1 with under one minute to play in the game, Cobber junior defenseman Jenei Estrada (Jr., Moreno Valley, Cali./Moreno Valley HS) scored a goal with :34 left in the game to cut the margin to 3-2. After a last second flurry, Concordia's record-setting season ended with a one-goal loss at the hands of last year's MIAC regular-season champion Gustavus. After a scoreless first period, the Cobbers got on the scoreboard first when Kali Palmer (Fr., North Richland Hills, Tex./Birdville HS) fired a 15-foot shot just over the outstretched pads of Gustie goaltender Molly O'Donnell. It was Palmer's first goal of the season. Gustavus (14-8-4) quickly countered when Josefin Pettersson finished off a 3-on-2 rush to tie the game at 1-1. Third period penalties would come back to haunt Concordia (14-8-1) as they allowed two power play goals in the decisive final frame. Laura Stypulkowski scored at 7:45, and then Bobee Jo Lang added a third goal at 11:59 to push the lead to 3-1. Concordia was forced to kill off several penalties late in the game, and had to overcome two different 5-on-3 situations and a Gustavus penalty shot to keep the game at 3-1. Gustavus was awarded a penalty shot with under three minutes to play when one of the Cobber defenders gloved the puck in Concordia's goal crease area. Petterson took the shot for Gustavus, and was cleanly stopped by Cobber goaltender Shyla Wilson (Sr., Cohasset, Minn./Grand Rapids HS) after she tried to drive in close and slide the puck under Wilson's pads. That set the stage for Concordia's attempted miracle comeback. After finally getting to play even-up, Concordia coach Kerry Norman pulled Wilson for an extra attacker, and the move paid off when Estrada skated in from the point to chip home a loose puck just in front of the Gustavus goal. Concordia was unable to get a shot off in the final 30 seconds of play and Gustavus held on for the 3-2 win. Wilson finished the game with 28 saves as compared to 16 for Gustie goaltender Molly O'Donnell. The Cobbers end the season by breaking the school record for overall wins in a season and highest finish in the MIAC. Concordia ended the year tied for second, with Gustavus, in the conference and with 14 overall wins. 2/26 Six Cobbers Earn MIAC Postseason Honors. - Katie Jacques, Sandra Rydén, Lindsay Kurtis, Bridgette Richter all named to the MIAC All-Conferecne Team. - Shyla Wilson, Lindsay Czarnecki earn MIAC All-Conference Honorable Mentions Honors. 2/22 Cobber Playoff Game With Gustavus to be Aired on Internet. The Concordia semifinal game with Gustavus on Friday, February 28 at 8:00pm at the Bielenberg Ice Arena in Woodbury will be aired live over the internet. Listeners can go to www.cord.edu/dept/sports/soundfb.html and hear all the live play-by-play action. 2/22 Cobbers to Play Gustavus in MIAC Semifinals. Concordia will play Gustavus in the semifinals of the MIAC playoffs on Friday, February 28 at 8:00pm at the Bielenberg Ice Arena in Woodbury, Minnesota. Last year the Cobbers lost to the Gusties 6-2 in the conference semifinals. Last weekend, the two teams split their season series at Gustavus. The Cobbers won the first game 3-1 and Gustavus came back to get the second game, 2-1 in overtime. 2/22 Cobbers Are a Touchdown Better Than Bethel, Win 10-3. Katie Jacques (Sr., Tempe, Ariz.) #13 drives towards the net in Concordia's 10-3 win over Bethel. (MOORHEAD, MINN.)--- Concordia scored seven unanswered goals in the last period and a half and blasted Bethel 10-3. With the win, the Cobbers clinch the #2 seed in the MIAC playoffs. Concordia finishes the season tied for second place in the MIAC - their highest finish in school history. The win improves their overall record to 14-7-1 on the year, and sets a school record for wins in a season. The previous school record for wins in a season was 13, set in 2000-01 and again last year. Katie Jacques (Sr., Tempe, Ariz.) scored a hat trick in her last game at the Moorhead Sports Center. The senior finished the game with three goals and an assist. Lindsay Czarnecki (So., Riverside, Cali.) added two goals and an assist, as the Cobbers finished the regular season by winning four of their last five games. Concordia (12-5-1, 14-7-1) scored the first two goals of the game before Bethel (3-15-0 MIAC, 4-20-0) was able to get on the board midway through the opening period. The Royals tied the game at 2-2, just eight seconds into the second period. The Cobbers countered with a goal 49 seconds later to reclaim the one-goal lead. Bethel fought back to tie the game at 3-3 at 2:28, and that would be the last goal that the Royals would score for the rest of the game. The Cobbers scored four more times before the end of the second period to take a 6-3 lead into the intermission. In the third period, Concordia distanced themselves from the Royals by scoring four more times. Jenna Johnson (Fr., Wadena, Minn.) made 24 saves in the game to pick up her second collegiate victory. Bethel goaltender Kim Myers had 23 saves in the losing effort. 2/21 Cobbers Take Care of Bethel in 1st Period, Win 5-1. 2/17 Shyla Wilson Named MIAC Player of the Week. Was named the MIAC Player of the Week. Concordia goaltender Shyla Wilson (Sr., Cohasset, Minn.) was named the MIAC Player of the Week for her two-game performance against Gustavus last weekend. Wilson stopped 45 of the 48 shots she faced in Concordia's series split with Gustavus. She stopped 24 of the 25 shots she faced in Friday night's 3-1 win over the Gusties. The victory marked the first time in school history that the Cobbers have beaten Gustavus. On Saturday, she had 21 saves in Concordia's 2-1 overtime loss. She currently has a 2.67 goals against average. With the win on Friday, the Cobbers remain in position to finish second or third in the MIAC - which would be the highest league finish in school history. 2/15 Cobbers Lose Overtime Thriller to Gustavus 2-1. 2/14 Cobbers Beat Gustavus for the First Time in School History. (St. Peter, Minn.)--- The eighth time is the charm. After losing to Gustavus for the first seven games in the past three years, Concordia finally go off the schneid and won 3-1. The Gusties were the only team in the MIAC that the Cobbers had failed to beat. The win deadlocks the two teams in the MIAC for second place. Both teams have 21 league points with three games remaining in the regular season. Concordia (10-4-1 MIAC, 12-6-1) got on the board first with just 17 seconds left to go in the first period. Senior Sandra Rydén (Jonstorp, Sweden) scored the first of the Cobbers three goals when she finished off a pass from Lindsay Kurtis (Jr., Phoenix, Ariz.). The power play goal capped off a strong opening period for Concordia, as they outshot host Gustavus 11-6. The Cobbers extended their lead to 2-0 at the 7:52 mark of the second period. Bridgette Richter (Fr., Long Beach, Calif.) scored her 11th goal while the Cobbers were shorthanded, and gave Concordia a two-goal advantage. Gustavus (9-3-3 MIAC, 11-7-4) was quick to answer when Josefin Petterson scored her fifth goal of the year, just 11 seconds into a power play opportunity. Concordia was able to add an empty-net goal at the end of the third period to bring the final score to 3-1. Katie Jacques (Sr., Tempe, Ariz.) scored her team-leading 18th goal of the year at the 19:47 mark to clinch the historic win for the Cobbers. Shyla Wilson (Sr., Cohasset, Minn.), after a sub-par performance in her last outing, returned to her all-conference form by stopping 24 of the 25 shots she faced. Gustavus goaltender Anne Kautzer made 19 saves in the losing effort. The two teams will play for sole possession of second place tomorrow afternoon at 2:00pm at Gustavus. 2/08 Cobbers Have a Reversal of Fortune and Beat Augsburg 5-4. 2/07 Cobbers Give Up 5 Straight Goals and Lose 5-4 to Augsburg. Shyla Wilson (Sr., Cohasset, Minn.) covers up the puck as the Cobber defense holds up an Auggie attacker. (Moorhead, Minn.)--- Concordia bolted to a 3-0 lead just eight minutes into the game, but gave up five straight goals and lost 5-4 to Augsburg. It was the fifth straight loss for the Cobbers and drops them into third place in the MIAC, just one point ahead of the Auggies. Concordia (8-4-1 MIAC, 10-6-1) received first period goals from Sandra Rydén (Sr., Jonstorp, Sweden), Lindsay Czarnecki (So., Riverside, Cali.) and Annie Knierem (Sr., Glasgow, Mont.) as they appeared on the verge of cruising to a key MIAC victory. Augsburg (8-5-0 MIAC, 10-9-1) was able to turn the game around just 54 seconds after the Cobbers gained the three-goal margin. Annie Annunziato ignited the Auggies when she scored a shorthanded goal at 9:06 of the opening period. It was the first of her three goals in the game. She also added an assist to finish the game with four points. Augsburg scored two more goals before the break to tie the game at 3-3. Lauren Chezick scored at 15:16 and then Annunziato tallied the equalizer at 18:45. Genevieve Allegrezza continued the five-goal onslaught in the second period when she scored at 5:49. Annunziato then completed her hat trick, and all the scoring the Auggies would need, when she scored the eventual game-winner at 10:29. After sophomore goaltender Jamie Savage (So., Apple Valley, Minn.) replaced starter Shyla Wilson (Sr., Cohasset, Minn.), the Cobbers were able to pull to within one when Katie Jaques scored her team-leading 14th goal of the year at 15:19. Neither team was able to find the net in the third period, as both goalies made keys saves to keep the game at 5-4. Augsburg netminder Katie Fedoryk finished the game with 20 saves. Wilson played the first 32:41 of the game and stopped 15 shots. Savage stopped 16 shots and did not give up a goal in the final 27:19. The two teams will finish the series tomorrow afternoon at 1:15pm at the Moorhead Youth Hockey Rink. The game times for the weekend's series with Augsburg have been changed. Friday night's game will start at 7:15pm instead of 7:00pm. Saturday's game will start at 1:15pm instead of the original 2:00pm start. Both games will still be still be played at the Moorhead Youth Hockey Rink. 2/07-08 Cobbers Host Augsburg at Moorhead Youth Hockey Rink. Rink is located at 707 SE Main Avenue. Directions from Concordia campus. 2/02 Cobbers Drop Close Contest to Fifth-Ranked Williams 2-0. BRUNSWICK, ME -- The Williams women's ice hockey team is coming together on the ice as the regular season winds down and the playoffs loom. Arena on the campus of Bowdoin College. with an assist on the Lui goal. 2/01 Cobbers Lose to Second-Ranked Bowdoin 4-1. BRUNSWICK, Maine - The Bowdoin College women's ice hockey team received goals from four different scorers in a 4-1 non-conference win over Concordia (Minn.) College on Saturday afternoon. Bowdoin, ranked second in the latest national poll, remains the only unbeaten team in any division of collegiate hockey at 14-0-2 while the Cobbers drop to 10-4-1 this season. second to give Bowdoin a strong 3-0 lead before Concordia got one back at 13:19 of the third from Sam Gunning (Fr., Baxter, Minn.). Bowdoin closed out the contest with a powerplay score at 17:08 from Rebecca Selden to take the 4-1 final. Concordia will face-off with Williams at Bowdoin's Dayton Arena on Sunday. 1/26 Cobbers Suffer Second Straight Loss to St. Thomas, Fall 5-3. 1/25 Cobbers Stumble in Second Period and Lose to St. Thomas 7-4. 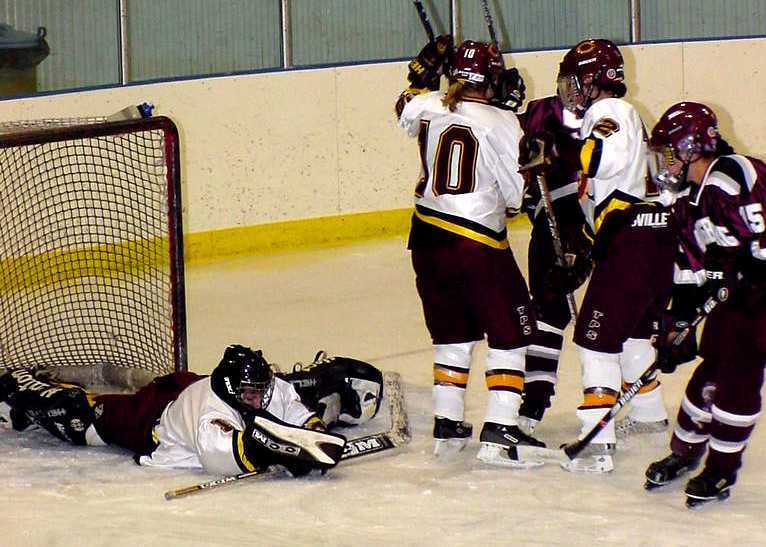 1/18 Cobbers Stay Perfect in 2003, Beat St. Ben's 5-2. 1/17 Cobbers Pull Away from St. Ben's, Win 5-1. 1/16 Katie Jacques Named USCHO Offensive Player of the Week. Concordia senior forward Katie Jacques was named the United States College Hockey Online (USCHO) National Offensive Player of the Week for her two-game performance against St. Catherine. For the weekend series Jacques had four goals and two assists. On Friday night, in Concordia's 4-1 victory, she scored the game-winning goal in the first period. In Saturday's game she scored three goals and assisted on another in helping Concordia to a comfortable 7-3 win. Jacques now has 13 goals and 5 assists on the year. She currently leads the MIAC in goals scored and is fifth in total points. 1/12 Arizona Connection Too Much for St. Kate's as Cobbers Win 7-3. 1/11 Cobbers Return to Action With 4-1 Win Over St. Catherine. 12/07 Cobbers Salvage 1-1 Tie, and One Point, at St. Mary's. 12/06 Cobbers Give Up Two-Goal Lead, Lose 3-2 to St. Mary's. 11/23 Cobbers Beat Hamline 7-2; Run Unbeaten Streak to Six. 11/22 Cobbers Bake Hamline for a Dozen; Hammer the Pipers 12-1. 11/16 Cobbers Blank St. Olaf 3-0; Earn Series Sweep. 11/15 Cobbers Pull Away From St. Olaf, Win 5-2. 11/12 Katie Jacques Named MIAC Player of the Week. Concordia senior forward Katie Jacques (Sr., Tempe, Ariz.) was named the MIAC Player of the Week for her offensive output in Concordia's two-game sweep over UW-Superior. Jacques scored four goals and had an assist in the two games played at UW-Superior. On Friday night Jacques had two goals and an assist. Her points came on three consecutive goals for the Cobbers and helped turn a tight 1-1 tie game into a 4-1 lead. Her second goal of the game was the eventual game-winner, as the Cobbers went on to win 6-3. On Saturday Jacques scored two more clutch goals, helping Concordia to a 5-4 overtime victory. In the two games Jacques had 13 shots on goal and collected five points. 11/10 Cobbers Win Overtime Thriller 5-4, Sweep UW-Superior. 11/9 Cobbers Open Season With a Bang, Beat UW-Superior 6-3. 10/27 Cobber 2002-03 Season Preview Now Online. Two-time All-MIAC. Concordia's all-time leading scorer. Usually a first-year head coach for a women's hockey team will find the cupboards bare due to graduation or a committed movement towards establishing a new program. That will not be the case as Kerry Norman steps up behind the bench for Concordia in her first season as head coach. Norman will find that the shelves are fully stocked and that the kitchen is in great shape. 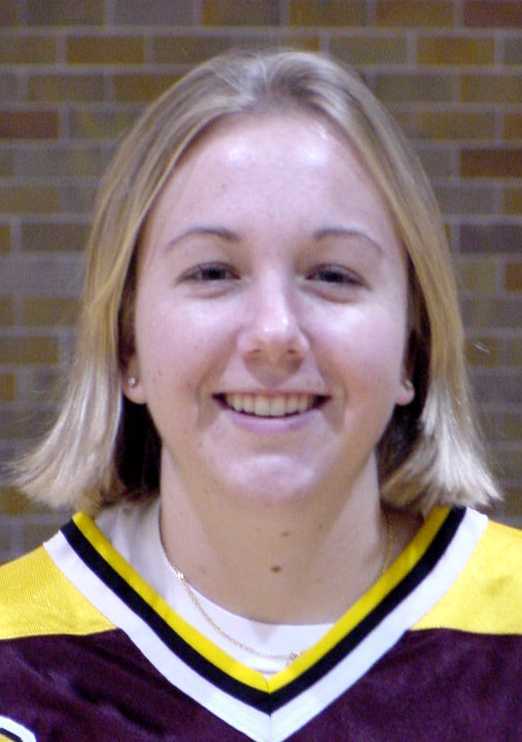 The reason for Norman to be optimistic going into the season is that she will have a nucleus of players that won a school record 13 games in 2001-02 and made the MIAC playoffs for the first time in school history. Of the 17 players on last year's roster, 13 will be returning for action in 2002-03. Included in those 13 are five players that were named to the all-conference or all-conference honorable mention teams from a year ago. The team will also return all eight of their top scorers from last season and their two-time all-conference goaltender. In addition to the 13 returning players, Norman has added a recruiting class that features 11 new players. The Cobber kitchen is fully loaded and ready to cook during the long winter season of 2002-03. 10/9 Preliminary 2002-03 Roster Now Online. 9/12 Insurance, Returning Athlete, & 1st Year Participation Forms are Now Online. 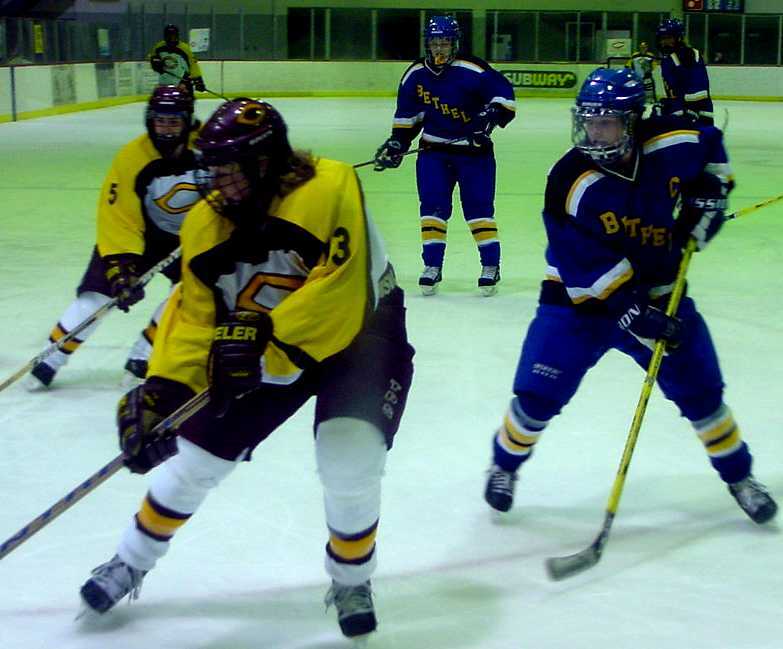 6/12 Cobber Women's Hockey Schedule for 2002-03 Now Online. 5/3 Kerry Norman Named Head Women's Hockey Coach.